BBC East will feature All Saints Hollesley, Suffolk in their Inside Out regional programme planned to be broadcast on Wednesday 5th November at 7.30 pm, probably about 9 minutes of transmission. It will also be available on BBC iPlayer. Following an approach by Richard Munnings the BBC became interested in Hollesley because of the use of computers and the simulator for teaching. They were particularly interested in the Listening Course based upon John Harrison’s CCCBR course. We have written a programme with the same purpose as John’s Strike (written for RISCOS) which will be available for use on MS Windows OS computers. The final content of the programme is not finalised but the focus changed from ‘bells and computers’ to the activities of the Hollesley band and friends. David Wernham videoed a full day Listening Course which involved a range of ringers from a very confident eight year old to experienced ringers ringing Bristol. Richard Munnings even attempted Bristol 16! On another day we borrowed Tony and Betty Baines mini ring and set it up on the Market Square in Woodbridge and then David returned to Hollesley to record our ringing for the Sunday service on 13th April. 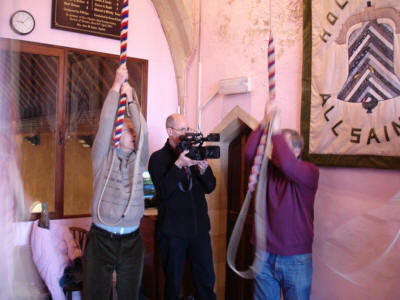 We hope that the programme will be good publicity for ringing in East Anglia.